Falls are the leading cause of death for workers in the construction industry, and OSHA is inviting businesses to take part in a national stand-down to stop falls from June 2-6. During this week, employers and workers are asked to voluntarily stop work to discuss fall prevention, including topics such as safe work on roofs, ladders and scaffolds. 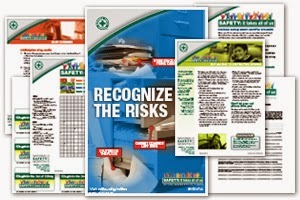 The goal is to raise awareness of preventing fall hazards in construction. A Safety Stand-Down is a voluntary event for employers to talk to employees about fall hazards and the importance of fall prevention. Fatalities caused by falls from elevation continue to be a leading cause of death for construction workers, accounting for more than a third of construction fatalities in 2012. Fall prevention safety standards were among the top 10 most frequently cited OSHA standards that year. As in the US, Canada's national chemical classification and hazard communication standard for workplace chemicals is changing. The Workplace Hazardous Materials Information System (WHMIS) is set to evolve in order to incorporate the Globally Harmonized System of Classification and Labelling of Chemicals (or GHS) for workplace chemicals. The Canadian Centre for Occupational Health and Safety (CCOHS) offers a number of resources related to GHS implementation, including posters, fact sheets, on-line courses, and a new on-demand webinar, Canada’s Implementation of the Globally Harmonized System (GHS) for Workplace Chemicals. The webinar is designed for WHMIS suppliers (or their representatives) who sell or import hazardous products for use in Canadian workplaces. This presentation will also be of interest to employers who manufacture hazardous products for use in their own workplaces. Browse GHS chemical hazard labels at ComplianceSigns.com.